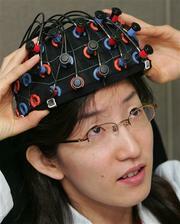 Wired News - AP News: "HATOYAMA, Japan (AP) -- Forget the clicker: A new technology in Japan could let you control electronic devices without lifting a finger simply by reading brain activity. The 'brain-machine interface' developed by Hitachi Inc. analyzes slight changes in the brain's blood flow and translates brain motion into electric signals. A cap connects by optical fibers to a mapping device, which links, in turn, to a toy train set via a control computer and motor during one recent demonstration at Hitachi's Advanced Research Laboratory in Hatoyama, just outside Tokyo." "...Hitachi's scientists are set to develop a brain TV remote controller letting users turn a TV on and off or switch channels by only thinking. Honda, whose interface monitors the brain with an MRI machine like those used in hospitals, is keen to apply the interface to intelligent, next-generation automobiles." "The technology could one day replace remote controls and keyboards and perhaps help disabled people operate electric wheelchairs, beds or artificial limbs." "Initial uses would be helping people with paralyzing diseases communicate even after they have lost all control of their muscles." ScienceDaily: Learning, Memory, And Progress Toward A Living Chip: "A new experiment has shown that it's possible to store multiple rudimentary memories in an artificial culture of live neurons. The ability to record information in a manmade network of neurons is a step toward a cyborg-like integration of living material into memory chips. ..."
"Itay Baruchi and Eshel Ben-Jacob of Tel-Aviv University used an array of electrodes to monitor the firing patterns in a network of linked neurons. As previous studies have shown, simply linking the neurons together leads them to spontaneously fire in coordinated patterns. In the study published in the journal Physical Review E the researchers found that they could deliberately create additional firing patterns that coexist with the spontaneous patterns. They claim that these new firing patterns essentially represent simple memories stored in the neuron network." "To create a new memory in the neurons, the researchers introduced minute amounts of a chemical stimulant into the culture at a selected location. The stimulant induced a second firing pattern, starting at that location. The new firing pattern in the culture along coexisted with the original pattern. Twenty-four hours later, they injected another round of stimulants at a new location, and a third firing pattern emerged. The three memory patterns persisted, without interfering with each other, for over forty hours." news @ nature.com--The patent threat to designer biology--Behind scare stories of building synthetic life lies the issue of who owns the biological parts. : A new patent application has been filed by Venter Institute in Rockville, Maryland, on "the world's first-ever human-made species," a bacterium created with synthetic DNA. The patent claims there are "381 essential genes needed to make an organism. The genes are found in Mycoplasma genitalium, a naturally slimmed-down microbe that has just 485 genes that encode proteins. "... If the patent were granted, anyone wanting to design an organism from these genes would need to apply for a license. "These monopoly claims signal the start of a high-stakes commercial race to synthesize and privatize synthetic life forms," claimed ETC's Jim Thomas. 'Will Venter's company become the "Microbesoft" of synthetic biology?'" Seeing the light | Economist.com: A new study is "being carried out in the eye hospitals of Tübingen and Regensburg universities, in Germany. 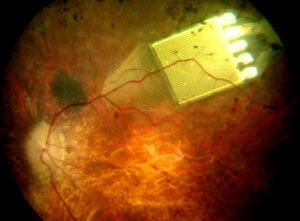 The project, which is being led by Eberhart Zrenner, involves implanting chips into the eyes of seven people who have lost their sight to a disease called retinitis pigmentosa."